There are many pump companies, but very few understand the mining industry and the many challenges that a mine has to face when it comes to pumping applications. Delivery delays are also one of the most important factors a mine will take into consideration. At Technosub, we have made our name by providing reliable engineering dewatering solutions and turnkey projects to mines. We also provide the fastest repair and equipment delivery in the Canadian mining industry. Over the last 30 years, more than 60% of all mining companies in Canada have put their trust in Technosub because they know they can rely on our expertise to cope with the challenges that arise from dewatering. Technosub offers a complete variety of pumps specifically made for the mining industry. Technosub’s Technojet pumps, MH series, work up to 64bar pressure. They are designed with multi-stages to match flow and pressure requirements, especially high-pressure ranges. The maximum flow obtained with the Technojet series is 0.450m³/hr and maximum head pressure can reach 650m. These pumps are manufactured in our factory according to each customer’s specifications. Technojet pumps are made of cast iron for suction, discharge and stages casings. Impellers and diffusers are made of duplex stainless steel designed to handle corrosive liquids. Technosub can offer a wide range of submersible multi-stage pumps. These pumps come with high tech ‘Subteck’ motors and cover deep wells with diameters of 4in, 6in, 8in and 10in with power ranging from 0.37kW up to 185kW. Technosub is also Tsurumi Canada. Technosub is the sole authorized Tsurumi pump distributor in Canada. Tsurumi carries one of the world’s most best-known lines of submersible pumps. The selection and variety offered surpass that of all competition. Durable and efficient, single-phase or three-phase industrial, these pumps are designed to perform under the most demanding conditions in the mining industry, including pumping corrosive liquid or slurry in high-volume and/or high-head dewatering applications. Noted for its dependability and high yield, the Technojet VT-SS series is manufactured by Technosub, offering its users exceptional advantages when dealing with corrosive water. Pump frames are made entirely of duplex stainless steel. Maintenance is simple and this pump series is well known for its durability and longevity. Maximum flow obtained with the Technojet VT-SS series is 0.450m³/hr and maximum head pressure can reach 400m. Technosub has the knowledge to fabricate custom pumps suited to our customers’ needs. We also manufacture a wide variety of spare parts for all makes of pumps. The company’s large installation also allows us to repair, adjust and test any pump in the shortest time in the industry. Technosub owns a test bench that is unique in Canada. 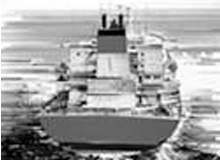 It is equipped with a 24,000gal basin and a 1MW generator. We can test pumps up to 800hp and 4,160V. All of the pumps that leave our facility are tested in order to make sure that their performance meets the customer’s requirements. All pumps are delivered with the test results, indicating the performance curves. Technosub has an interesting portfolio of solutions and realisations in mine dewatering. We have been working with the EPCM formula for many major projects in Canada. Every mine comes with its own challenges. All of our products and solutions are developed and tailored to adapt to our customers’ limitations, be they environmental, operational, technical or financial. Technosub is named 'Company of the Year' at the 39th Gala of the Rouyn-Noranda Chamber of Commerce in Canada. Managing underground sludge the easy way. Technosub has the knowledge to manufacture pumps, parts and complete packages designed for the specific needs of its customers. Technosub joins forces with Toyo/Hevvy to create a range of submersible pumps. Technojet MH Series comprises high-pressure multistage centrifugal pumps that are able to overcome difficult mining conditions. 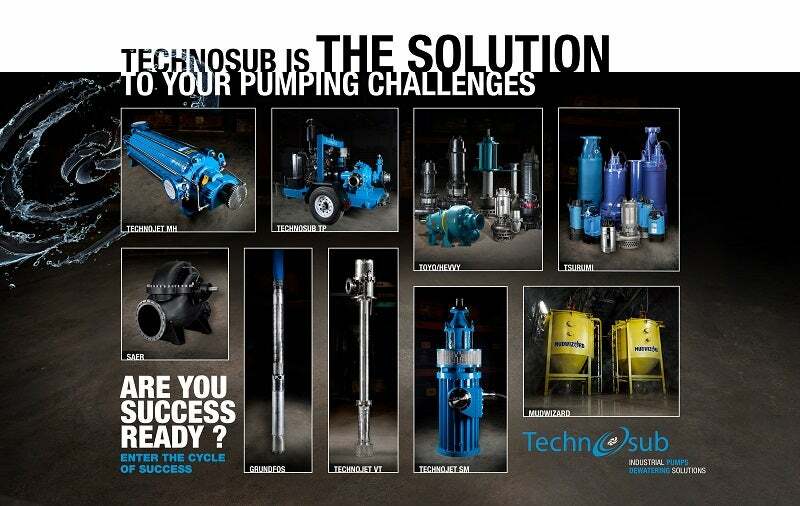 Technosub is the master distributor in Canada of the famous Tsurumi submersible pumps. At Technosub, performance and continuous improvement is our commitment. We drive for results and excellence with energy and a sense of urgency and are passionate about achieving results that surpass expectations. Rugged Tsurumi pumps are loaded top to bottom with features to withstand your toughest dewatering applications. Technojet multistage pumps are the best pumping solution on the market, able to overcome the difficult conditions encountered in mines. High pressure applications, immediate delivery and customised designs make this pump the ultimate standard for the Mining Industry. Technosub is the sole authorised Canadian distributor of Tsurumi Pumps, one of the world's best known lines of submersible pumps. The Gahcho Kué diamond mine is located approximately 280km north-east of Yellowknife in the Mackenzie District of the Northwest Territories, Canada. The Gibraltar copper-molybdenum open pit mine is located in British Colombia, Canada, approximately 60km north of Williams Lake. Technosub will be attending a series of industry events this year to showcase its portfolio of pumping solutions. Schwing Bioset is pleased to announce that Technosub has signed as our mining distributor for Canada. An amazing innovation by Technosub. Continuing the company's expansion throughout western Canada, Technosub is proud to announce the opening on December 1 2013 of a new stocking warehouse and office facility in Saskatoon, Saskatchewan. This strategic location will give the mines in this province a local resource for better service and delivery. The Maintenance Engineering / Mines Operators' Conference (MEMO) 2013, to be held from September 29 to October 1, 2013, at Kamloops Convention Centre in Kamloops, British Colombia, will be hosted by CIM's South Central British Columbia Branch, in conjunction with the Maintenance and Engineering Society and the Surface and Underground Societies. Technosub has released a white paper entitled 'Tsurumi Pump: Contractor/Mining Pumps'. Technosub, a company providing reliable engineering dewatering solutions and turnkey projects to mines, is attending the 23rd World Mining Congress in Montreal, Canada, from August 11-15 2013. Technosub, a manufacturer of multi-stage, vertical, and submersible pumps, has released a free-to-download brochure on Mining Technology. In this brochure, you can find information on the high pressure multistage centrifugal pumps that make up the Technojet MH series. Technosub will exhibit at this year's MINExpo in Las Vegas, US. Technosub has just finished production of its latest high-pressure pump in the Technojet series. Technosub has released a free product guide outlining Tsurumi Pumps' contractor pumps, engine driven pumps, and generators, on Mining Technology. Technosub, the sole Canadian distributor of Tsurumi pumps, has released a free product guide on Mining Technology. Technosub, a manufacturer of multi-stage, vertical, and submersible pumps, has released a free white paper on Mining Technology. Technosub will be exhibiting at the CIM show in Edmonton, Canada, from 6-9 May. In its native Canada, Technosub has become a benchmark in pumping solutions for the mining industry. Technosub is proud to presents its new web site, a modern concept that allows faster access to its products, services and recent accomplishments. Technosub has just finished the production of its latest high-pressure pump in the Technojet series. This multistage pump was designed to respond to the urgent needs of an underground mine in Northen Quebec, Canada. 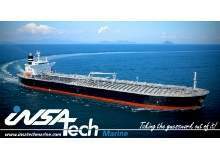 It also completes the selection of models available in the Technojet series.